Every year, in conjunction with a research firm, Forbes compiles a list of 500 prominent employers from around the U.S. to determine which companies and institutions are preeminent in their fields. They surveyed 30,000 anonymous American workers from a broad range of companies and organizations. The workers who participated, were scored based on how likely they’d be to recommend their employer to others. Appearing at 363 in the group of top 500 large companies, was the Los Angeles County Sheriff’s Department (LASD). The LASD was the only police agency in America to make the list. “I’m am very proud of the direction our organization is headed. 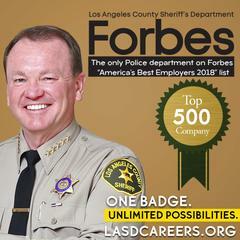 This ranking is further validation of the hard work all our LASD employees are investing each day to make our department among the best in America,” said Sheriff Jim McDonnell. The LASD serves Los Angeles County, California, an area totaling approximately 4,084 square miles, with a total county population of almost 10 million people (2010 U.S. Census). LASD is the largest Sheriff's Department in the world. With more than 18,000 employees and a geographic area of responsibility equivalent to 30 major cities, the LASD is large and diverse. On average, LASD employees have two million public contacts, log 1.15 million phone or service calls, and respond to more than 29,000 --- 911 calls each year. In all, our employees speak 60 different languages. The LASD provides general law enforcement services to 42 contract cities, 141 unincorporated communities, 216 facilities, hospitals, and clinics located throughout the County, 9 community colleges, the Metropolitan Transit Authority and 38 Superior Courts. LASD also provides services such as laboratories and academy training to smaller law enforcement agencies within the County. Additionally, LASD is responsible for securing and providing services, food, and medical or mental health treatment for an average daily inmate population that exceeds 16,000 in 7 different correctional facilities. We are looking for more great people to join our team through our character-based hiring process. Start the process towards your career with the LASD today at WWW.LASDCAREERS.ORG or call 1-800-A-DEPUTY. The Los Angeles County Sheriff’s Department has UNLIMITED POSSIBILITIIES when it comes to the many career paths we offer. Once on LASDCAREERS.org website, click on “One Badge Unlimited Possibilities” logo located on the center of the page and you will be directed to the available open positions our Department offers, including of course the positions of Deputy Sheriff Trainee and Custody Assistant.